GeorgeClymer is a Legacy Library. Legacy libraries are the personal libraries of famous readers, entered by LibraryThing members from the Legacy Libraries group. » George Clymer's legacy profile. GeorgeClymer is also an author. About meGeorge Clymer (16 March 1739 - 24 January 1813), merchant and Pennsylvania statesman and Signer of the Declaration of Independence as well as the Constitution. Orphaned at an early age, Clymer apprenticed with his uncle, merchant William Coleman. In 1759 he joined Henry and Robert Ritchie in a partnership to import European and East India merchandise. He received large bequests from his maternal grandfather and his uncle, William Coleman. Clymer was an early leader of the patriot movement in Pennsylvania, and became a member of the Philadelphia Committee of Safety in 1773 (having held local offices previously). Two visits to Boston in 1773 and 1774 confirmed his support for the patriot cause. In July 1775 he was named co-treasurer of the Continental Congress, with Michael Hillegas, resigning the position when he was elected a member of the Continental Congress. 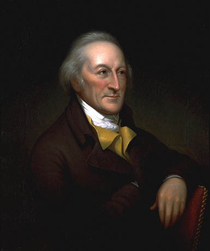 Clymer served in Congress 1776-1777 and 1780-1782, sitting on several committees. Following the Revolution, Clymer held a seat in the Pennsylvania House of Representatives, 1785-1788, and was a delegate to the Constitutional Convention. He was elected as a Federalist to the House of Representatives, serving 1789-1791 and holding the chairmanship of the Committee on Elections. He was appointed collector of excise duties in 1791, but resigned the position in 1794 during the Whiskey Rebellion. In 1796 he was one of the commissioners charged with negotiating a treaty with the Creek and Cherokee nations in Georgia. Clymer was elected a member of Franklin's "Young Junto" in 1759, but does not appear to have accepted his election. His uncle, William Coleman, was an original member of the American Philosophical Society. In 1786 Clymer was elected a member of the APS, subscribing £5 toward the construction of the APS hall. He rarely attended APS meetings, but did submit an essay in 1802 concluding that Philadelphia enjoyed greater health than European cities. The first president of the Philadelphia Bank and Pennsylvania Academy of Fine Arts, Clymer also served as vice-president of the Philadelphia Agricultural Society, the Philadelphia Manufacturing Society, and the Society for Political Inquiries. He was also a member of the Library Company of Philadelphia, the Hand-in-Hand Fire Company, and a contributor to the Pennsylvania Hospital, Silk Society, and College of Philadelphia. Clymer sat as a trustee of the University of the State of Pennsylvania beginning in 1779. Clymer married Elizabeth Meredith in March 1765; the couple had eight children. During his lengthy retirement Clymer managed his lands in Pennsylvania, New York, Kentucky, and Indiana, also writing much on agriculture and holding office in the various civic institutions he favored. He died at his son's home, "Summerside," in Morrisville, PA, and was buried in the Quaker burial ground in Trenton, NJ. About my libraryClymer's library is documented in the inventory of his estate, taken 1813 and currently missing from the Philadelphia County Probate Records. A microfilm copy exists, but is missing the page containing 41 of the library's 71 titles. The 30 titles listed in the inventory are included here currently, as are the known titles from other sources. The library was valued at $142.80, out of a total estate value of $2,077.12. The books were bequeathed by Clymer to his son George Clymer, Jr., who gave forty volumes to the American Philosophical Society in February, 1816 (some of these are still in the APS collections).